Run by Sally Evans and her partner Ian King, Old Grindle’s Bookshop in Edinburgh was always significantly populous with poets. 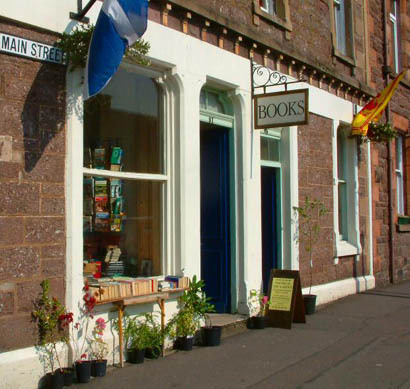 It became the first home of the diehard press, Poetry Scotland broadsheet, and Ian’s craft binding. Now based in Callander, the project has developed in strength on all fronts. King’s Bookshop and bindery is a place of emergence and convergence. One passing poet expressed what many feel in describing it as his ‘decompression chamber’ on the way to and from the North. In this audio interview, Sally Evans describes Poetry Scotland as having three strands – the broadsheet itself, the website, and the annual weekend when poets from all over Scotland come to the bookshop and share their work and vision. Brought up in Northumberland, Sally Evans writes poetry that often reflects her sense of place in nature, a perspective energised by being based in a rural location. Together with Ian, she has made King’s Bookshop into a haven for thinkers and dreamers.